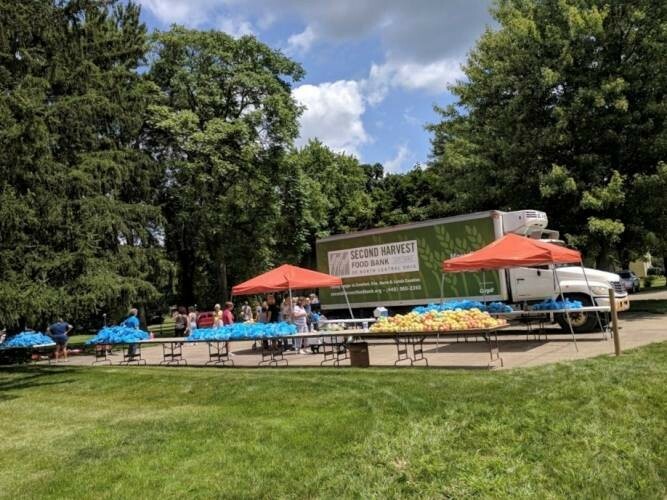 A bright and sunny afternoon in late July brought so many residents and neighbors in need from the community of Wellington out to the first-ever Mobile Produce Pantry at Wellington’s St. Patrick Catholic Church. There were 199 families served that day. Each family went home with 35-50 pounds of fresh produce. St. Patrick Catholic Church in Wellington, Ohio was certified as a new partner charity with Second Harvest in July of 2018. Darlene Lauffer is the person heading up their work at St. Patrick’s. We first knew Darlene when she organized the St. Jude, Elyria food pantry and ran their program for many years before moving to Wellington. 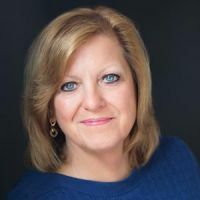 Darlene saw the need in the community and also saw the opportunity to be a resource for those in need in the southern part of Lorain County, too. She was able to get the approval for this undertaking from the parish pastor, Fr. Trask, and she began to recruit volunteers to help. So far there are thirty people from their small church who are willing to give of their time, and there is plenty to do. Darlene brought the “Dinner Bag” concept over from her St. Jude days. Once a month, clients get everything they need to prepare one meal as soon as they get home. Everything is in one bag, including the recipe. Last month, clients were given everything for a cold pasta salad, with hot dogs (don’t knock it till you have tried it) broccoli, cauliflower, Italian dressing & green pepper. They liked this one! The main goal for the pantry is to not spend more than $5.00 for each dinner bag and share that with the clients. With some help from SHFB and other donations the pantry can always do that, Darlene assures. 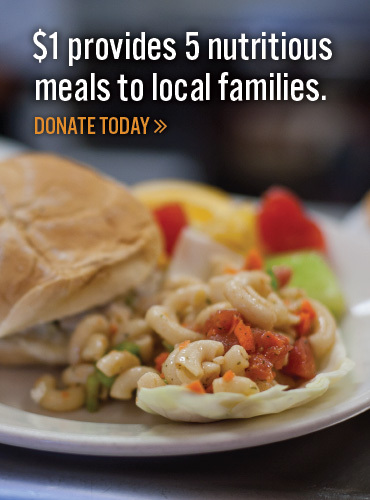 With some creative thinking, it is possible to prepare meals for a family with just $5.00. She says they want recipients to be able to go to a food pantry and find things on the shelves so they can go home and make a meal or shop in a grocery store and get what they need to prepare a meal for $5.00. We asked Darlene what she likes best about this work. “My favorite part, “ she responded, “Is talking to the recipients one on one, getting to know them and having them get to know me. I like it when they smile at me or give me a hug or thank me for what we are doing. I love it when I give them a recipe to try and the next month they tell me how much they liked it.” Wellington and southern Lorain County will be sure to benefit from the perfect recipe of care, compassion and hard work from the St. Patrick’s food pantry and mobile produce pantries.